Giving evidence before the Transport Committee today, Ministers Mike Penning and Norman Baker declared that Britain has nothing to learn about cycling safety from the Netherlands because our rate of cycling fatalities per head of population is lower. Given that both ministers immediately went on to note that many more people cycle in the Netherlands than in Britain (Mark has the quotes), it is difficult to know what to make of this*. It should be blazingly obvious that if hardly anyone cycles in Country A it is likely to have a lower rate of cyclist fatalities per head of population than Country B where nearly everyone cycles. Any Minister who claims this as evidence that cycling is safer in Britain is misleading either parliament or themselves. Penning and Baker seem quite proud of their factoid, which implies the latter. That is worrying, and not just for cycling policy. As many people on Twitter immediately pointed out, a reasonable measure of cycling safety would be to calculate deaths or serious injuries per mile or kilometre cycled. And in fact that's what the statisticians at the Department for Transport do. Their table RAS53001 shows trends in fatality and casualty rates per kilometre for various modes of transport. The fatality rate for cyclists in 2010 was 22 per billion kilometres, down by a third from 33 in 2001 but still some seventeen times higher than the fatality rate for those in cars. So how does this compare to the Netherlands? We are fortunate that the Dutch road safety institute SWOV publishes comprehensive statistics on road safety trends in that country here - and in English too. These figures include fatality rates for the various modes of transport, equivalent to the DfT statistics mentioned above (note, SWOV calls passenger casualties 'Victims per seat'). In 2009, the latest year available, the fatality rate for cyclists in the Netherlands was 9 per billion kilometres, less than half that in Britain (21 in 2009). So cycling in the Netherlands, using a sensible measure, is more than twice as safe as in Britain. The evidence of the Ministers to the Transport Committee was wrong (as if that wasn't already obvious). The SWOV data throws up some other interesting comparisons. The fatality rate for car drivers or passengers in actually lower in Britain than in the Netherlands (in 2009, 1.6 per billion km compared to 2.1). This means that in Britain, fatality rates for those in cars are 13 times higher than for those on bikes, compared to 4.4 times in the Netherlands. 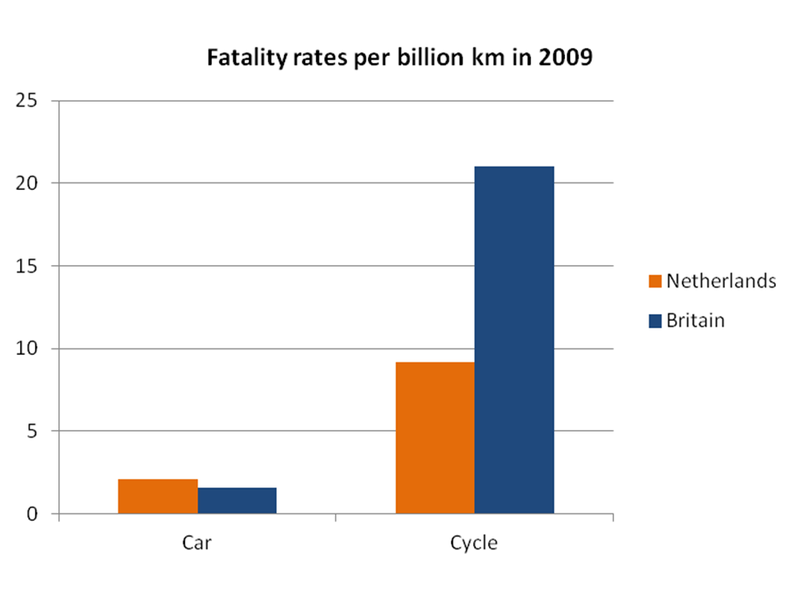 The chart below compares fatality rates for cars and bikes in the two countries - again, all based on official statistics. In summary, we have nothing to teach the Netherlands on cycling safety, and I trust the Transport Committee (and the Times, who will be reporting on the hearing) won't fall for such obvious nonsense from the two Ministers. * It reminded me of the line in Ulysses to the effect that Ireland had the honour of being the only country to have never persecuted Jews "because she never let them in". Given the huge disparity in average speeds (outside urban areas at any rate :) an even better measure of comparative safety might be fatalities per million journey hours. I haven't tuits to research the data right now, but I suspect on those terms cycling would be significantly *safer* than driving in the Netherlands, and possibly so even here in the UK. Great idea perlmonger - and you only need to know or estimate mean speed to get that info. Thanks again for the information Jim. In reply to perimonger, whether you consider a better measure of safety to be fatalities per km, or per hour, depends whether you regard cycling, or any other mode of transport, as a means of covering distance, or a means of occupying time. This is a philosophical question. All forms of transport can have both functions. But I think most people would have a "common sense" opinion that the first is the primary purpose. There is no doubt in my mind that Baker and Penning misused those statistics (what did Mark Twain say about damned lies?) and even if they qualified their presentation, they still managed to leave an impression with the uninitiated that cycling is safer here than there. The population-based statistic does however have some validity, and needs to be addressed – can be addressed, in my view, thus: assuming that all those Dutchmen and women who cycle would otherwise have used an alternative form of transport, how many more, or fewer, casualties would have arisen? If they had all walked, probably more. If they had all driven, probably fewer, based on the casualty per km statistic for each. I imagine that in a non-cycling nation there would be a cut-off, somewhere, for most people where they switch from walking to driving, so there will be some in both directions. This of course ignores other health factors influenced by the choice between car and bike, where I think the evidence is firmly in favour of active travel over inactive, for improvement in obesity, cardiovascular fitness, lung function, etc and hence life expectancy, and this effect greatly outweighs the road danger effect. It also doesn’t take account of the secondary casualty effect, on which I don’t think I have seen any stats. We see figures for casualties for walkers, cyclists, car occupants, per km walked, cycled, or driven. 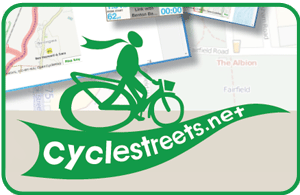 We see figures for pedestrians, cyclists and car occupants per year. We don’t see, but could presumably work out from data used to compile the other stats, the cyclist or pedestrian casualties per km DRIVEN by motor vehicles. If we leave aside the distraction of the “safety in numbers” argument, it must surely be the case that, as it is generally motor vehicles (cars included) which kill both pedestrians and cyclists on the roads, a reduction in car mileage, isolated from any change in cycle or walking mileage, must lead to a reduction in pedestrian or cyclist casualties, or indeed in their casualties per km. The relationship between the two is complex. Finally, I think one can focus too much on absolute numbers. I have absolutely no doubt that there is a statistic somewhere that says more people die gardening or doing DIY than cycling. We could all stop putting up shelves and concrete over our lawns, but we won’t. We know that some risk is inevitable if we are not to fall into total paralysis. We just have a sense of where the risk tips from acceptable to unacceptable. In UK cycling, for most people it is still unacceptable. If the NL data is looked at closely it can be seen that older cyclists make up a higher proportion of cyclists deaths compared with the UK. If the mid range age groups are compared, the figures are more like 5-6 for the Netherlands and 21 for the UK. You may be interested in David Hembrow's post that comments on the politians' cyclebabble.